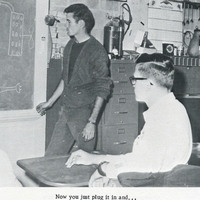 Lyman High School student at the chalkboard during a TEC Club meeting during the 1965-1966 school year. Lyman High School is a Seminole County Public School located in Longwood, Florida. In 1923, a board of trustees agreed to construct a new school to accommodate the growing population in the Longwood and Altamonte Springs area. Construction began at 1725 County Road 427 in 1924 and opened in September 1924 with Professor Howard Douglas as its first principal. Lyman School, as it was originally called, was named after Howard Charles Lyman, a citizen who was active in planning the school's establishment, but died a few days before construction began. In just two years, Lyman became an accredited junior high school and its campus had been expanded with six rooms. With W. J. Wells as principal, the Lyman School achieved accreditation through 12th grade in 1929. In 1963, the school was renamed Lyman High School when it became an accredited institution with Carlton D. Henley as principal. In 1966, Lyman High became integrated with both white and black students. Original black and white photograph. 8 x 4 inch print reproduction of original black and white photograph by Greyhound Staff of 1966: Greyhound 1966, (Longwood, FL: Lyman High School, 1966): Seminole County Public Schools Collection, UCF Public History Center, Sanford, Florida. Digital reproduction of 8 x 4 inch print reproduction of original black and white photograph by Greyhound Staff of 1966. Greyhound 1966, (Longwood, FL: Lyman High School, 1966): Seminole County Public Schools Collection, UCF Public History Center, Sanford, Florida. Now you just plug it in and. . .
Greyhound Staff of 1966. 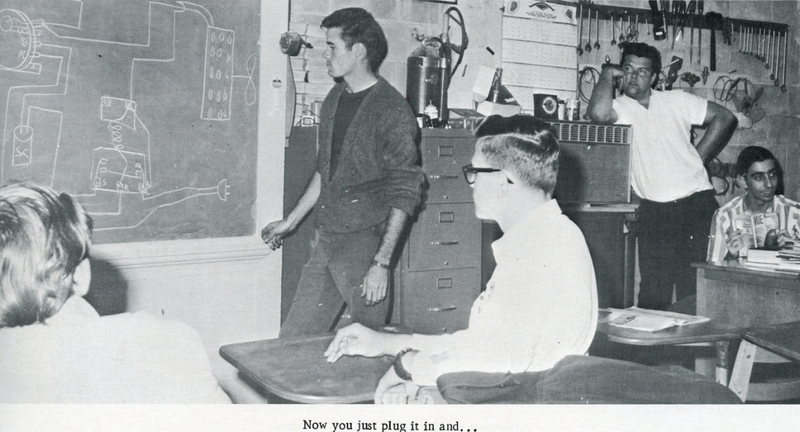 “Lyman High School TEC Club.” RICHES of Central Florida accessed April 20, 2019, https://richesmi.cah.ucf.edu/omeka/items/show/2816.